The main feedback is from Bev N. of Canada who wrote to us about our article The Koran vs Genesis, raising some interesting questions about the Fall. Dr Carl Wieland replies. We also print below some comments from happy American readers who have found that Creation magazine and the Journal of Creation (formerly TJ) are still available in the US (see this page for details), after receiving the impression that they were not. I just read David Catchpoole’s article on Genesis vs. the Koran. In it, he says that Eve misquoted God by saying that He had said not to touch the tree instead of saying not to eat of it. How could she have misquoted and been wrong when sin had not yet taken place? CW: You are right that sin was not yet in the world. But a mistake, if not deliberate, is not moral transgression. I.e. if a person makes a false statement, believing it to be true, they are not culpable. I am sure that in passing on a recollection, we often do this. Sometimes it is a straight misunderstanding, without any moral wrongdoing being involved. Also Adam may have passed on the instruction on to Eve as she had not been yet created when God told Adam not to eat of the tree. He may have been the one who said not to touch it to her. You’re right. And the more that things are passed on from person to person, the more likely such misconstruction becomes. But again, it was not sin if that’s how he misconstrued it, or if she did. Adam and Eve were not the last people to ‘put a fence around the Torah’ by any means. Eve was the first compromiser of God’s Word with fallible science—she made her own interpretation of sense data authoritative over God’s word. That is, the fruit was good for food and delightful to the eyes, so she figured that this overruled God’s clear command against eating (Genesis 3:6). All the same, it is quite possible that God gave separate instructions of which the Bible reader is not informed. The Bible was written for a ‘high context’ society, where much backround knowledge is presumed by the reader, as opposed to our ‘low context’ society where everything must be spelt out (see this article). Given that God told Adam to tend the Garden, He may have instructed Eve not to eat the fruit by God, but might have been told not to touch the tree at all. This would not create a contradiction, because absence of proof isn’t proof of absence. Maybe Moses [under the inspiration of the Holy Spirit] didn’t think it was important enough to repeat God’s instructions to Eve because he already indicated the instructions to Adam, and relating what Eve said to the serpent did the trick. An example of this is that we are simply told that Eve gave the fruit to Adam, and are not told what conversation ensued. Do we really think that Adam ate the fruit accidentally? That would mean that he had also been deceived—by Eve—and there is no mention of that. He tries to avoid personal responsibility by blaming Eve outright for giving it to him. He doesn’t claim not to know what he ate. I think we make too much of this. That may well be so. I personally don’t see the difference as all that drastic; I can imagine myself saying to my child, ‘Don’t touch the strawberries in the garden, or else’, and in doing so I certainly don’t think that they would be tempted to stroke or pat them—i.e. I mean ‘don’t pick and eat them’ of course. Equally, if I were to say to one child ‘Don’t eat the strawberries in the garden’, and if that child were to pass on to its sibling the news that ‘Dad said don’t touch those strawberries’ I would not even bother to correct her, as it gets the point across. I have heard the same argument used to defend the importance of memorizing the Scripture. Indeed. It is of course important not to add to or subtract from the Word of God, though it is not immediately clear to me how the misquote, if such it was, made sin more likely to enter the world. 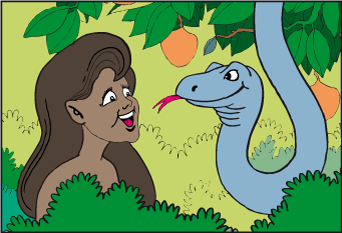 One argument is that her belief that she was not even to touch may have made it easier for the Serpent to make God’s prohibition seem far more unreasonable. If I believed that Eve was deceived because she did not quote the Bible correctly, then I would be afraid to ever try and quote a verse from memory. For what it’s worth, Dr David Catchpoole, the article’s author, assures me that, even though he sees the misquote as significant, he sees the Bible’s reference to Eve being deceived as referring to the Serpent’s deception of her, not the misquote. This is how my other colleagues understand 1 Tim. 2:14 as well. We would also point out that Eve was the first compromiser of God’s Word with fallible science—she made her own interpretation of sense data authoritative over God’s word. That is, the fruit was good for food and delightful to the eyes, so she figured that this overruled God’s clear command against eating (Genesis 3:6). I am amazed at how much liberty the New Testament writers take in quoting the Old Testament e.g. Heb. 10:37–38 which quotes Hab. 2:3–4. Actually, they were following standard Jewish exegetical procedures for their time. Memorizing and appropriately applying Scripture was of utmost importance. In any case, the Holy Spirit can surely paraphrase Himself if He wishes. I have seen this theory of Eve misquoting the instruction given about the tree but I feel that you are making too much of it, and need to be careful in interpreting this portion of Scripture. Eve was deceived by the Serpent by eating of the fruit, and her deception did not begin when she said that we should not touch the tree. As indicated, that would be both my and David’s understanding, too. Perhaps the article could have been worded differently to make that clear. Hello, I was— am a US subscriber; I did not realize until today that Creation magazine was still being published. I have almost all the issues from the past ten years, and just renewed my subscription today. But how can I get the issues that I missed— which I think is from March 2005 or 6 to today? I would love to order them if they are available. Thanks for your help. Some recent back issues are certainly available from our US office—Ed. My husband and I were actually trolling the net looking for an alternative Creation ministry to lend our support to as we no longer agree with the direction [another US creation ministry] is headed in. Little did we know we would find our beloved magazines (and writers!) again. We are so sorry to hear that things went sour. We, like many others, were under the mistaken impression that TJ was no longer being published and that Creation had merely changed names. >We would love to have the back issues that we have missed as we save each and every copy. The last issue of Creation we received was December 2005 and the last copy of TJ was December 2004. Thank you so much! We look forward to supporting your ministry. Thank you very much too—Ed. Hey! I just got my first new Creation magazine package after the separation hiatus from AiG. I’ve only gotten so far as to read the CMI update and glance at the cover, and I am so glad to have it! Kudos and commendations for all of the important work done by your organization! I have been a subscriber to Creation magazine for several years. I was dismayed when I found that the separation(?) or specialization(?) that took place between AIG & CMI left me without my subscription. That problem has since been rectified. >On to my point. I personally find Creation magazine to be attractive and worthwhile because it is not just a magazine about creation. I think it goes beyond such a narrow focus and qualifies as a popular scientific magazine, similar in scope to secular publications, but based on truth and proper respect for God’s special revelation. This is an under-served market— popular and accurate news about science and nature that is not being used to promote evolutionary and secular propaganda. I’m an engineer and I simply like science and learning about the amazing world around us. In my past, as a believer in evolution, I used to receive Scientific American and Science News and read National Geographic. These publications do not appeal to me anymore— they contain so much bad science, even beyond evolutionary articles; the non-scientific thinking that must be followed to allow evolution to be called science has infected secular science in an ever-growing array of fields. Your magazine is an oasis in this man-made desert. >Your magazine is accessible enough that my kids (16, 14, 10) read it. I have used your magazine and creation science materials to inoculate my children against the lies of this world. I think it has been very successful. Please continue to teach us about real science and keep it beautiful and interesting and relevant. May God bless you all and bless you work. Thank you. We regard Creation as the antidote to secular glossy publications that push evolution. Why should the devil have all the best magazines (to paraphrase Gen. Booth of the Salvation Army)? See also 15 ways to refute materialistic bigotry: A point by point response to Scientific American, Archaeoraptor hoax update—National Geographic recants! and National Geographic is wrong and so was Darwin—Ed. Is ‘the ultimate curse’ the result of ‘the sin of Adam and Eve’?